I have been engaged in a series of interviews, radio/TV discussing the topic, "Is The Tea Party Dead?" Because I am black, every interview has begun with me being asked my take on Ferguson before discussing the Tea Party. Talk about the excrement hitting the fan; liberal interviewers are outraged when I say blacks are not routinely shot by police and that the MSM is promoting a deplorable, divisive and irresponsible false narrative. Clearly, the Left is using lies to spread their despicable evil lie that blacks are targeted and murdered by police. I am struck by the liberal interviewer's passion behind spreading their lie. They act as if their belief is as true as there is a sun in the sky. The liberal media's attitude is, of course the police murder black males. The media will slap around anyone who states otherwise. My God, what is wrong with these people in the MSM? Furthering the socialist/progressive agenda and bolstering Democrat voter registration and turnout has trumped all sense of decency and morality. If dividing Americans along racial lines and selling millions of black youths the lie that whitey (Republicans, Conservatives and police) are out to get them will further the Left's cause, the Left says so be it. This truly is spiritual wickedness in high places. After several rounds of verbally beating me up side the head, realizing they can not force me to agree with their claim that cops are shooting blacks at will, the liberal interviewers move on to gleefully proclaiming the death of the Tea Party. They cite how numerous Tea Party candidates have been defeated in primaries by GOP establishment candidates. As chairman of The Conservative Campaign Committee, my team, my wife and I have been boots on the ground in Mississippi, Tennessee and other Senate races. We are away from home so much that upon our return, Sammy our greyhound only gives me an acknowledging glance and retires to his bed. I think the pet sitter has conspired to steal Sammy's affection from me. But, that's another story. In every Senate race, we (CCC) have witnessed the intense involvement, commitment and enthusiasm of the local Tea Party groups in support of our candidates. Every race has been a David vs Goliath scenario; highly qualified grassroots funded Tea Party conservative candidates vs deep pocketed GOP establishment and big business funded and MSM supported Democrat-Lite GOP primary candidates. 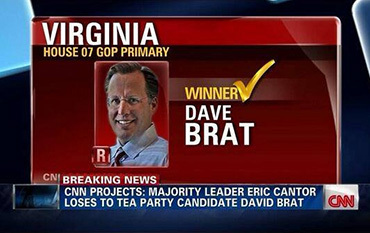 While Dave Brat's stone launched from his Tea Party slingshot, struck and defeated his GOP Goliath, we have lost several races. Our most recent disappointing loss is Joe Miller's run for U.S. Senate, Alaska. Several great patriots in our Tea Party family came together to endorse Joe; Sarah Palin, Mark Levin, Dr. Dobson of Focus on the Family, Conservative Campaign Committee and others. No, the Tea Party is not dead, nor will it ever die as long as there are those of us who love, God, family and country. Without a doubt, we in the Tea Party have a very high mountain to climb. With all due respect, I say that is Okay. Our cause is just and God is on our side. We have lost battles, but the war is far from over. Our mission each day is to wake up every morning with faith and hope in our hearts which empowers us to faithfully continue fighting the good fight for that which we know is right. Faithfulness is the key to our victory.